Expect an eclectic menu at this downtown Miami restaurant, along with a first-rate wine collection. 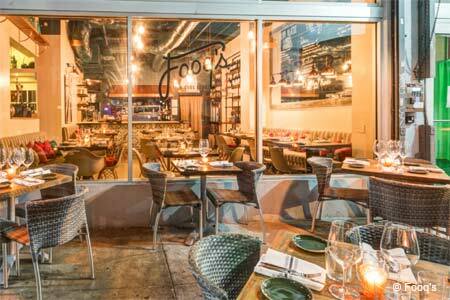 : Hyper-local and homey Fooq's in downtown Miami is from owner and Manhattan native David Foulquier (Gigi, OTC). Foulquier and chef de cuisine Bryan Rojas (Cypress Room) have created an eclectic menu. Meatballs crafted with ground brisket and Berkshire pork? Crudo? They’re both here. Most engaging is the Trio of Jars; cross your fingers for a foie-anything filling on that day. Brussels sprouts come honey glazed and slathered in a green garlic yogurt sauce. The namesake burger (with a patty that blends short rib, brisket and skirt steak) is one of the best in town, and the bucatini amatriciana is laden with smoked pancetta, sweet onions, San Marzano tomatoes, garlic chips, Sicilian chili flakes and Pecorino Romano. Fooq's lacks a liquor license but makes up for it with a first-rate wine collection, curated by Foulquier, its labels spanning from France to Hungary and Napa to Canada. The Persian Sundae for dessert features saffron and rosewater gelato from midtown’s Latteria Italiana, shredded halva, roasted salted pistachios, pomegranate molasses, medjool dates and Valrhona chocolate pearls.